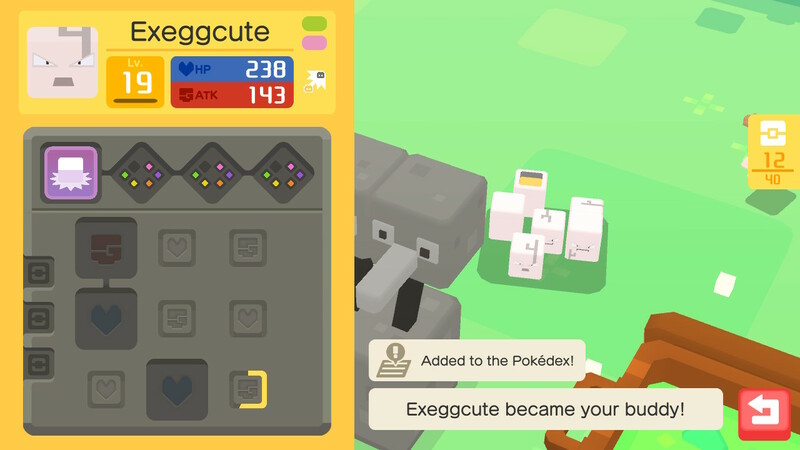 Nintendo’s latest Pokémon title, Pokémon Quest, is a charming adventure set in the world of Tumblecube Island, a blocky, colorful place full of Pokémon who are looking forward to meeting you (and many who are just interested in fighting you). The premise is pretty simple: You’ve landed on a newly discovered island where, with the help of a Pokéball-shaped drone named MoBee, you’ll traverse themed areas to uncover the history of the island, encountering Pokémon’s Generation One favorites and enticing them to join you at your camp. To do so, you’ll be crafting delicious recipes using a Cooking Pot in your base, using ingredients obtained when sending your team of Pokémon on Expeditions. Pokémon Quest’s cooking system is relatively simple as well, featuring a small assortment of ingredients that, when cooked into specific recipes using various combinations of ingredients, will attract Pokémon of various types to become your new buddy. Each recipe can attract Pokémon of a specific type or color and will require you to complete a certain number of Expeditions in order to complete. You may even attract shiny Pokémon, which are Pokémon featuring an alternate colorway than their non-shiny brethren. Fancy! The biggest limiting factor here is time, as you can cook only one recipe at a time in a Cooking Pot, and you start out with only one. The only way to obtain more Cooking Pots is by spending real money in the eShop, but you will be able to upgrade your Cooking Pot through regular game progression. Harder recipes will require your Pokémon to complete more Expeditions, but if you don’t want to wait you can spend PM Tickets to speed things up. The number of PM Tickets required to automatically complete a recipe will depend on how many of the required Expeditions have been completed. The game’s energy system will limit how many Expeditions you’re able to go on in one gaming session, but most early recipes will require only two to four Expeditions to complete. 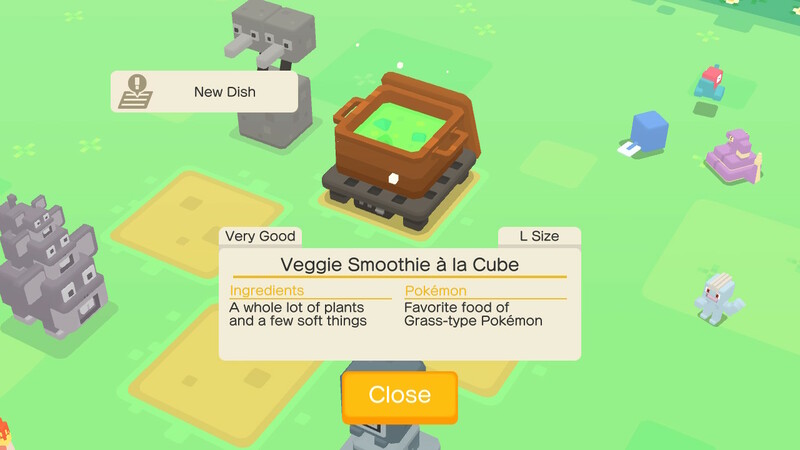 Pokémon Quest features a common, discovery-based cooking system. You’ll start with a checklist of unknown recipes, and as you experiment with different combinations you’ll create dishes and “unlock” the recipe in your list. Somewhat frustratingly, discovering a new recipe doesn’t explicitly state actual ingredient requirements, but rather gives you an idea of how many of each type of ingredient you’ll need to use (more on that below). When cooking a recipe, it’s important to note that each slot in the Cooking Pot will actually require a specific quantity of the ingredient placed within (noted in the "Ingredients Amount" section on the top of your pot. 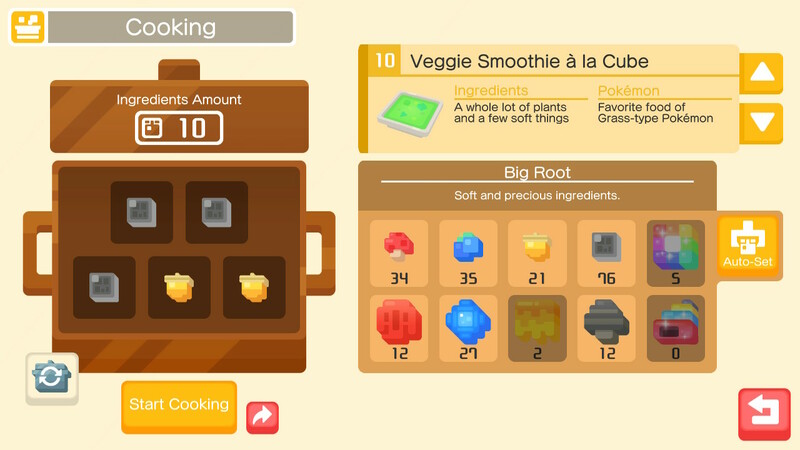 The first Cooking Pot you’ll obtain requires three ingredients per slot, and that number will grow as you upgrade it. This makes better recipes more challenging (and ingredient consuming) to create, but making more difficult recipes using high quality materials will attract rarer and potentially more powerful Pokémon. Cook a higher quality recipe, attract higher quality Pokémon—it’s as simple as that. Cooking Pot: Each slot requires 3 of the selected ingredient. Bronze Pot: Each slot requires 10 of the selected ingredient. Silver Pot: Each slot requires 15 of the selected ingredient. Gold Pot: Each slot requires 20 of the selected ingredient. Immediately upon finishing a recipe, Pokémon will show up at your camp to enjoy their favorite meal. You’ll always attract at least one Pokémon, and sometimes multiple at a time will arrive. Every Pokémon that arrives to your camp will become your buddy, so you don’t have to worry about choosing between them. Once a Pokémon has joined your camp, it will take up residence in the grounds and can be taken on Expeditions as part of your three-Pokémon team. The limiting factor of your Pokémon collection is the size of your Box, which can be enlarged by spending PM Tickets. In the meantime, any excess or duplicate Pokémon can be used for Training other Pokémon, essentially consuming them in the process and freeing up valuable space. In doing so, the Pokémon you have selected to train will gain some experience. 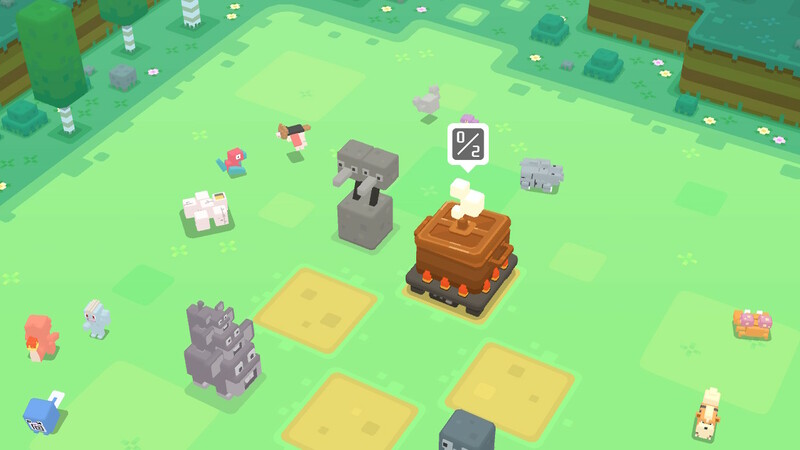 There are only a handful of ingredients in Pokémon Quest: eight standard ingredients and two rare ingredients. Ingredients are picked up by your Pokémon on Expeditions, and you’ll cook recipes using specific combinations. Each standard ingredient, which feature soft or precious qualities, has a corresponding color, which should be taken into account when cooking. The recipes aren’t too complex, especially if you’re familiar with the Pokémon types and their corresponding in-game reference color. Additionally, some recipes will simply attract Pokémon of a specific color (including red, blue, yellow or grey). Water type Pokémon, for example, will prefer a recipe made primarily with blue ingredients. Things get a little more complex when you’re trying to attract Pokémon with at type color that isn’t featured in the ingredients, such as the pink color used for Psychic types. Rare ingredients are an exception to this, each contributing a specific benefit to your recipe. Additionally, there are two rare ingredients which you can randomly obtain during Expeditions. 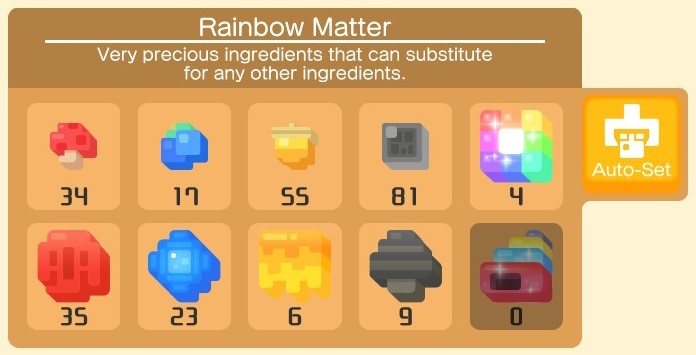 Rainbow Matter: Very precious ingredient that can substitute for any other ingredients. Mystical Shell: Extremely rare ingredient that can be used to attract Legendary Pokémon! All of the standard ingredients will be available in your first few Expeditions, and each stage features a color wheel that will show you the distribution of each color of ingredient you can expect to earn. Rainbow Matter can drop randomly in any stage, and Mystical Shell won’t be available until much later when you’re facing Legendary Pokémon. Even though Rainbow Matter looks pretty, you don’t want to create a recipe using it exclusively, as you’ll just end up with the Normal-type attracting Mulligan Stew. Instead, use it as a catch-all item to fill in any recipe for which you’re missing an ingredient. Mulligan Stew: Any five (5) ingredients. Attracts random Pokémon. Red Stew: Five (5) red ingredients. Attracts reddish Pokémon. Ex: Tiny Mushroom x5 or Big Root x5. Blue Soda: Five (5) blue ingredients. Attracts bluish Pokémon. Ex: Bluk Berry x5 or Icy Rock x5. Yellow Curry: Five (5) yellow ingredients. Attracts yellowish Pokémon. Ex: Apricorn x5 or Honey x5. Grey Porridge: Five (5) grey ingredients. Attracts greyish Pokémon. Ex Fossil x5 or Balm Mushroom x5. Mouth-Watering Dip: At least three (3) blue ingredients. Attracts blue Pokémon. Ex: Bluk Berry x3, Tiny Mushroom x2. Plain Crepe: At least three (3) “sweet” ingredients and two (2) “Grey” ingredients. Attracts Normal-type Pokémon. Ex: Bluk Berry x3, Fossil x2. Sludge Soup: At least four (4) mushrooms and (3) “soft” ingredients. Attracts Poison type Pokémon. Ex: Balm Mushroom x2, Tiny Mushroom x3. Mud Pie: At least two (2) minerals and three (3) “soft” ingredients. Attracts Ground type Pokémon. Ex: Fossil x2, Tiny Mushroom x3. Veggie Smoothie: At least four (4) plants and two “soft” ingredients. Attracts Grass type Pokémon. Ex: Big Root x3, Balm Mushroom x1, Apricorn x1. Honey Nectar: At least four (4) “sweet” ingredients and three (3) Yellow ingredients. Attracts Bug type Pokémon. Ex: Honey x3, Bluk Berry x2. Stone Soup: At least four (4) hard ingredients and two (2) minerals. Attracts Rock type Pokémon. Ex: Fossil x3, Icy Rock x2. Light-as-Air Casserole: At least three (3) minerals and two (2) plants. Attracts Flying type Pokémon. Ex: Icy Rock x2, Big Root x2. Hot Pot: At least three (3) mushrooms and one (1) red ingredient. Attracts Fire type Pokémon. Ex: Balm Mushroom x3, Big Root x2. Watt a Risotto: At least four (4) soft ingredients and three (3) yellow ingredients. Attracts Electric type Pokémon. Ex: Honey x3, Balm Mushroom x1, Big Root x1. Get Swole Syrup: At least three (3) sweet ingredients and two (2) mushrooms. Attracts Fighting type Pokémon. Ex: Bluk Berry x2, Honey x1, Tiny Mushroom x1. Ambrosia of Legends: At least four (4) mystical ingredients. Attracts Rare and Legendary Pokémon. Ex: Any mixture of Rainbow Matter and Mystical Shell. Cook the right recipes and you’re on your way to catching all 151 of the original Pokémon in Pokémon Quest. Good luck!